The Low-Down: Hellboy, a cult comic creation dreamt up by Mike Mignola, is a fascinating meditation on the eternal ‘nature vs. nurture’ debate: can a demon child rebel against the blood that flows through his veins and choose his own fate? 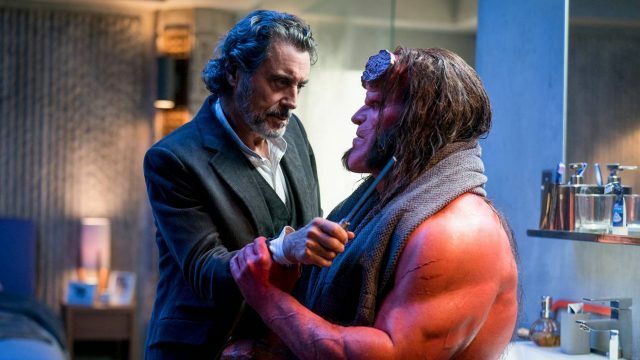 The movie-going public was first introduced to the existential crisis that is Hellboy in 2004 by visionary director Guillermo del Toro, whose gothic sensibilities and love of the ugly misfit were a perfect fit for the source material. 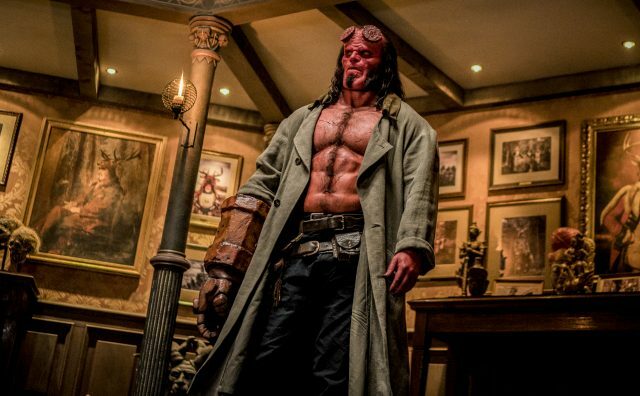 15 years and a couple of jettisoned productions later, the third Hellboy film – a del-Toro-free reboot, rather than a sequel – is finally thundering into cinemas, and will have you wondering if it was worth all that time and effort. 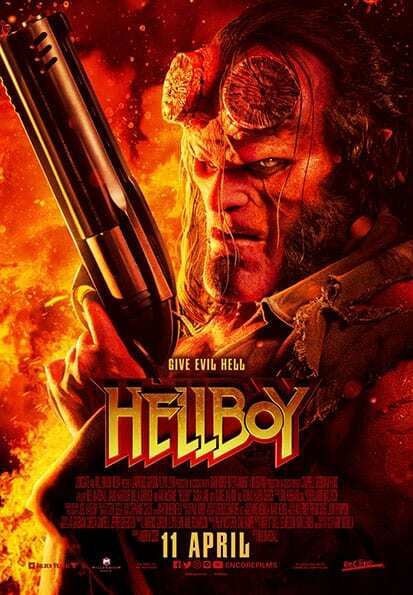 The Story: Hellboy (David Harbour) – under the guidance of his adoptive father, Trevor (Ian McShane) – is hunting down monsters for the Bureau for Paranormal Research and Defense (BPRD) when destiny comes a-calling. 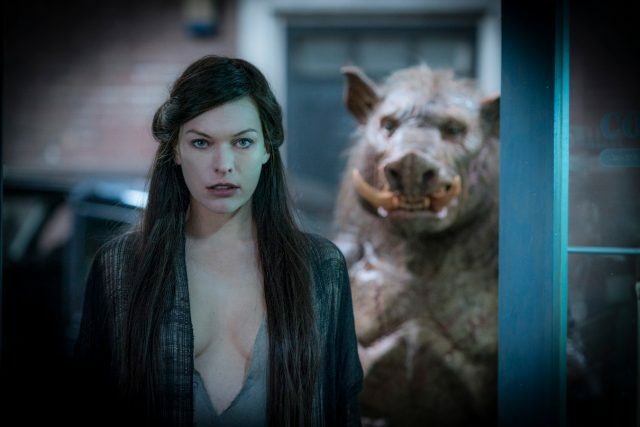 Nimue (Milla Jovovich), a dastardly sorceress of world-destroying power, is set to break free from her several prisons so that she can turn the world of men into a haven for monsters. 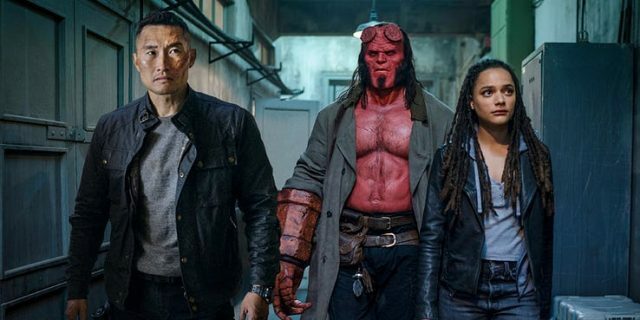 Accompanied by living ouija board Alice Monaghan (Sasha Lane) and grumpy BPRD agent Ben Daimio (Daniel Dae Kim), Hellboy must decide if he will help or hinder Nimue as she sets the apocalypse in motion. David Harbour stars as ‘Hellboy’ in HELLBOY. Photo Credit: Mark Rogers. The Good: This new incarnation of Hellboy is fierce and unapologetic in everything it does – from its shiveringly awful monsters to its explosive moments of mayhem and carnage. If that’s your kind of thing, you’ll enjoy what director Neil Marshall, best known for cult horror flicks like The Descent and Dog Soldiers, is going for here. He leans heavily into the ‘creature’ aspect of ‘creature feature’, particularly in nightmarish scenes featuring Nimue regaining her body (think Frankenstein, with an added cringe factor) and unholy mess of a witch Baba Yaga collapsing and contorting her way across the screen. The Not-So-Good: Unfortunately, the film is a mess in pretty much every other way, teetering between brilliant, batshit and bad – often in the same moment. Part of that is due to the strangely uneven special effects and prosthetics, which range from eye-popping to laughable. But it’s in Andrew Cosby’s desperately plot-obsessed screenplay too, which contains some great, fun ideas but constantly undercuts itself with painfully banal dialogue and minimal character development. It’s a very peculiar experience to be simultaneously fascinated by and disappointed in a scene or character, and that keeps happening throughout Marshall’s film. Safe Harbour? You’d never know it beneath the unwieldy prosthetics, but Hellboy is played – this time around – by one of the breakout stars of Netflix’s Stranger Things. It’s a shame that you can barely see what Harbour is bringing to the character and the performance; his hangdog charm and ability to emote is buried under layers of red make-up and a stubbornly fake chin. He looks great in still photographs, but often appears clunky and clumsy in motion. Script-wise, Harbour isn’t given much to do, beyond playing catch with the next plot point and battle sequence. As a result, his Hellboy winds up as the least interesting character in a film actually named after him. Running The Good Race If nothing else, Hellboy has a lesson to teach Hollywood and casting agents the world over about whitewashing and the importance of representation. Ed Skrein was originally cast as Ben Daimio, but voluntarily withdrew from the project when he realised that the character was of Japanese origin. It’s still annoying that Asians from different countries are interchangeable in Hollywood terms – Kim is of Korean descent – but, hey, baby steps are better than nothing. At least Kim acquits himself quite well in a complex role, although his British accent is wobbly at best. Recommended? It’s a toss-up. There are enough good ideas and visual flair for Hellboy to be worth a watch, but it’s also sorely missing the crucial ingredients that made del Toro’s films take flight: heart and soul.